I recently took delivery of some very large pieces of flat-packed furniture. It was packaged in double-corrugated cardboard that was free of printing. I’m not sure what was more exciting – new furniture or finally having the perfect pieces of cardboard to build the Forty-two Roads cardboard play kitchen. The plans for the kitchen have been burning a hole in my pocket for months and coincidentally, just when I finally get some decent cardboard, Forty-two Roads releases a new cardboard creation, a play shop and tollbooth. 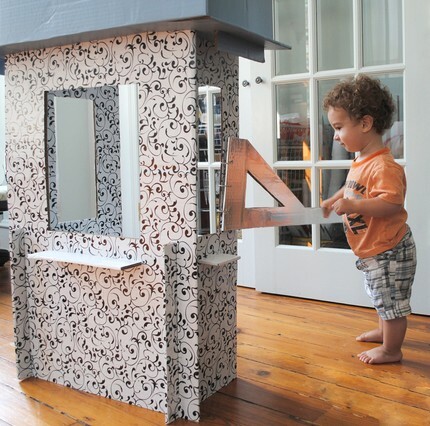 Like the kitchen, the play shop design maximises the qualities of cardboard as a building material – it’s strong and durable but at the same time lightweight and portable. The play shop can be disassembled for storage and reassembled in minutes. Cleverly designed joins mean that the pieces slot together and no glue, nails or screws are needed. 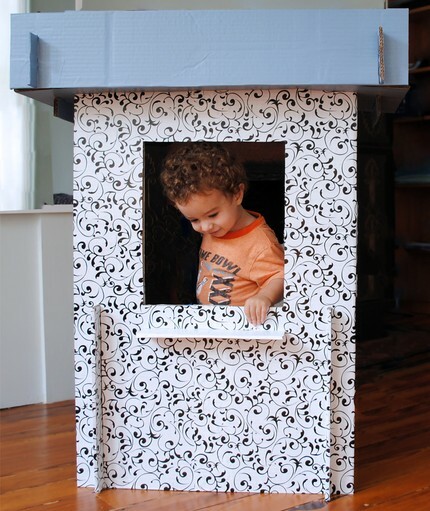 Playing ‘shops’ is always a popular imaginary game with children however I’m sure there are a few Cosy Coupes cruising around that would love to stop at a tollbooth – the simple addition of a cardboard ‘boom-gate’ transforms the shop into a tollbooth. A PDF file of the shop/ tollbooth plans and instructions is available from Forty-two Roads for US$12. If you missed the cardboard kitchen post, check it out here.